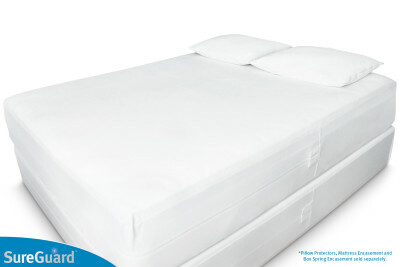 Keep your mattress looking like new with a SureGuard Mattress Encasement – the ultimate protection for any bed! 6-8″, 9-12″, 13-16″, 17-20″ deep. 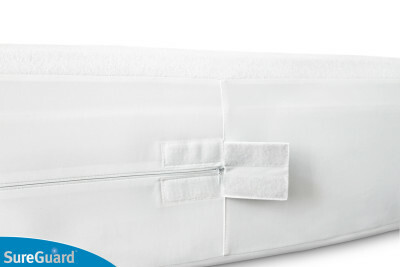 This ensures a perfect, snug fit for any mattress. 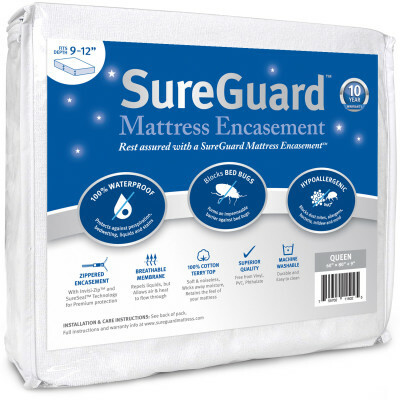 SureGuard Encasements provide six-sided premium protection against sweat, urine, liquids and stains – keeping your mattress fresh and clean. 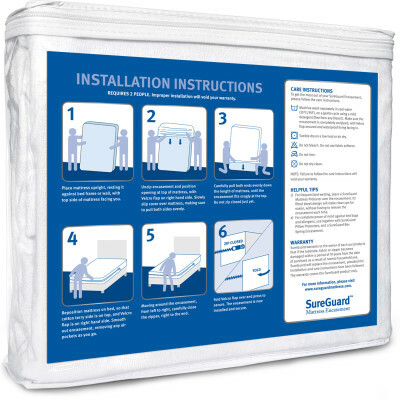 For frequent accidents, place a SureGuard Mattress Protector over the encasement. 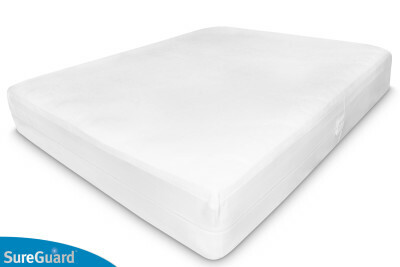 The protector’s fitted sheet design will make clean-ups far easier, without having to remove the encasement each time. The super fine zipper with Invisi-Zip and SureSeal technology completely seals off your mattress from bed bugs – both entry and exit proof. For total protection, buy together with SureGuard Pillow Protectors and a Box Spring Encasement. Nothing can penetrate this mattress cover, not even dust mites, pollen, pet dander, mildew or mold. It is an absolute must for asthma, eczema and allergy sufferers. The light-weight 100% cotton terry top surface wicks away moisture, creating a soft comfortable sleep space, without changing the feel of your mattress. The advanced membrane backing blocks liquids, while allowing air and heat to flow through – keeping your bed cool and dry all night long. The encasement is perfect for any type of mattress, even memory foam, where it allows your body heat to flow through and activate the foam’s contouring properties. NOTE: If you have a heated mattress pad on the bed, it is better to place the encasement UNDER the pad. If the encasement is placed OVER the pad, the high direct heat may damage the waterproof backing. Machine wash with cool water. Tumble dry on a low heat or air dry. Do not bleach, iron or dry clean. Each zippered mattress protector is made with the finest materials and put through rigorous quality checks to ensure it protects your mattress, wash after wash. For best results, please follow the care instructions. SureGuard Mattress Encasements contain no Vinyl, PVC, Phthalates or fire retardants, making our products breathable, odorless and free from toxic chemicals. To demonstrate that our protectors and encasements are low-emitting and promote better indoor air for your family and environment, all SureGuard products are GREENGUARD Gold certified for low chemical emissions. 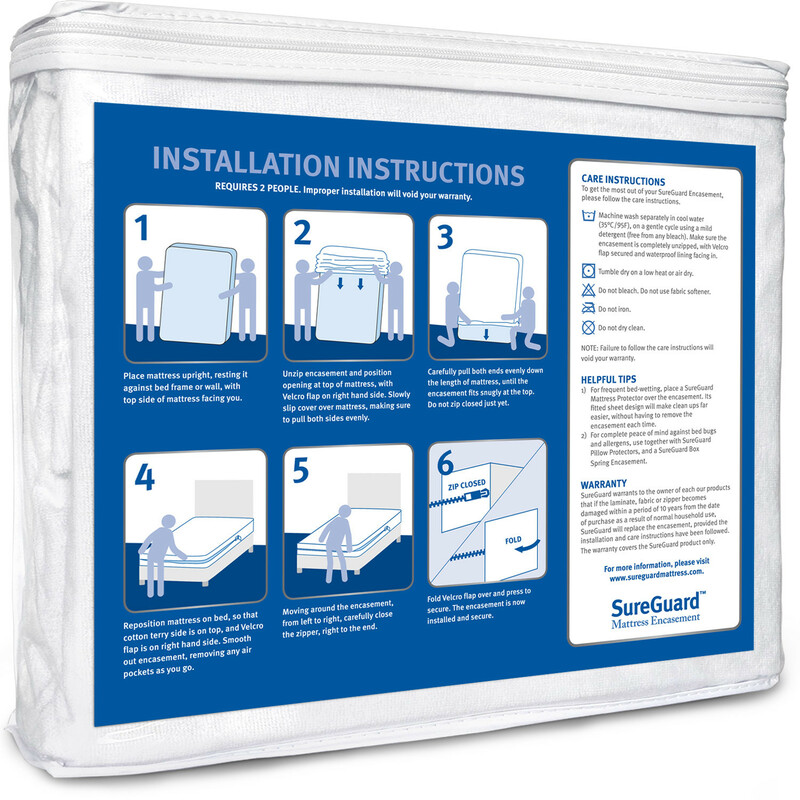 When you buy a SureGuard Mattress Encasement, you have a full 30 days to try it risk-free. If it does not live up to your expectations, simply return it for a full refund (less shipping costs). In addition, all SureGuard products come with a 10-year full replacement warranty. Rest Assured with a SureGuard Mattress Encasement.